Our target guests are humble, adventurous, budget travellers that are looking for something different, that can think out of the box, are camping orientated and love the great outdoors. The rustic facilities provide something different from the normal existence. People that love baseline and bush camp camping in allocated but undeveloped camp sites enjoy our relative luxury. We do however find that modern 4x4 guests with all the gadgets that can open and close, hardly ever stay, or find themselves at home here. 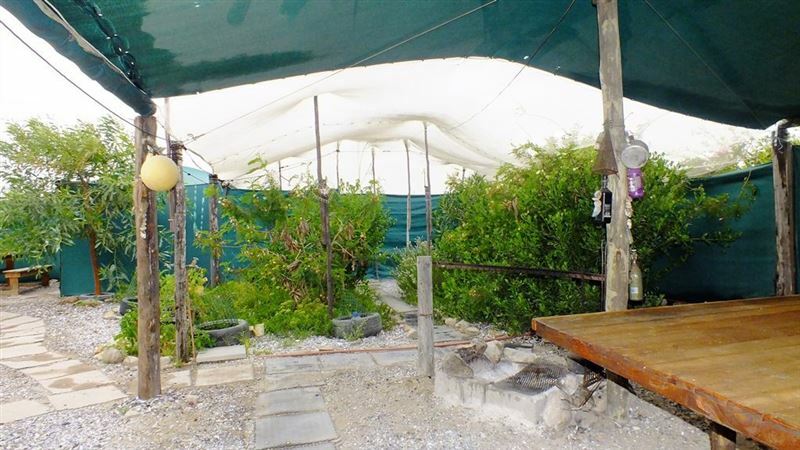 Guests that are looking for the normal suburban and lodge style accommodation will also not enjoy our environment. If you love a camp fire and braai on the ground (not a barbeque on a stand-up drum), and the sun on your body when you shower, then this is for you! 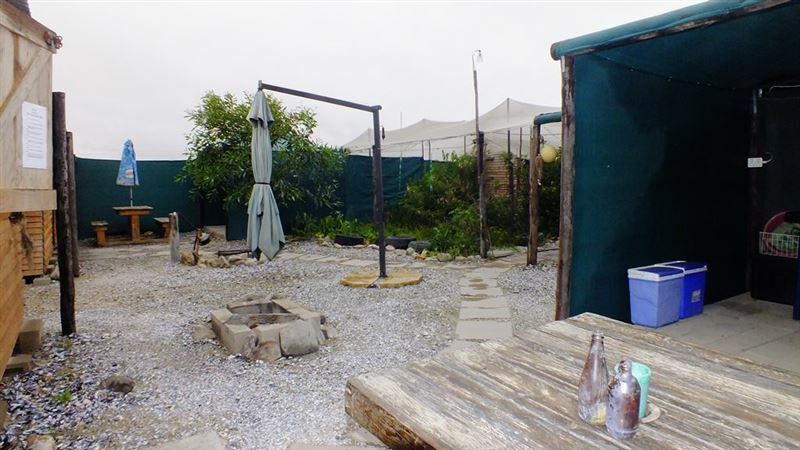 Our focus is on experiential immersive eco-tourism - letting you experience life in Port Nolloth and the Richtersveld for the desert and industrial environment that it really is - in a safe, friendly and hospitable milieu. Please read this full description of our facility attentively, and share it with your family before booking, in order to avoid disappointment.We can hear the sea at night but do not have a sea view (700m from the sea). Neither do we have TV&apos;s - our guests focus on relaxation and communication :-). We are completely off the grid and uses gas for cooking and warm water, and solar power for light electrical appliances (laptops and cell phone). 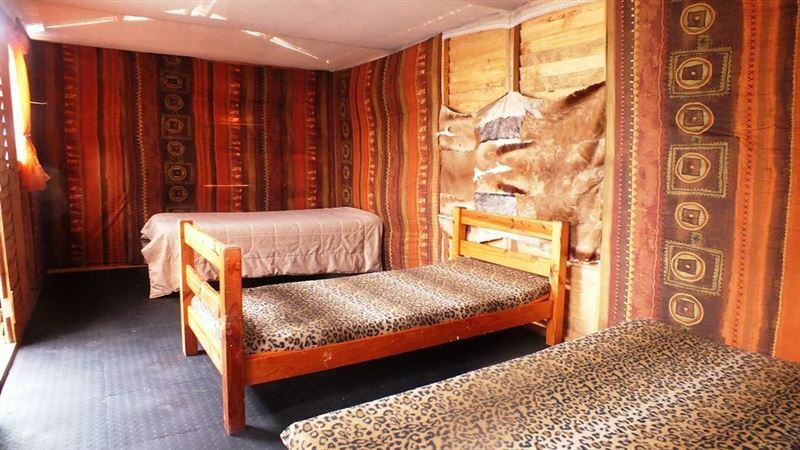 The Camp consists of 3 wooden cabins which sleep 4 people each (1 double bed and 2 single beds). Each cabin has its own outdoors kitchen. 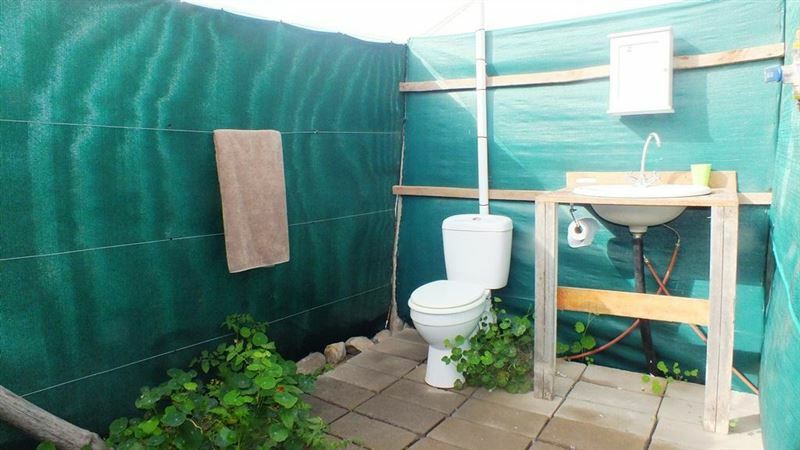 An open air, yet private shower and toilet is shared by the three cabins. 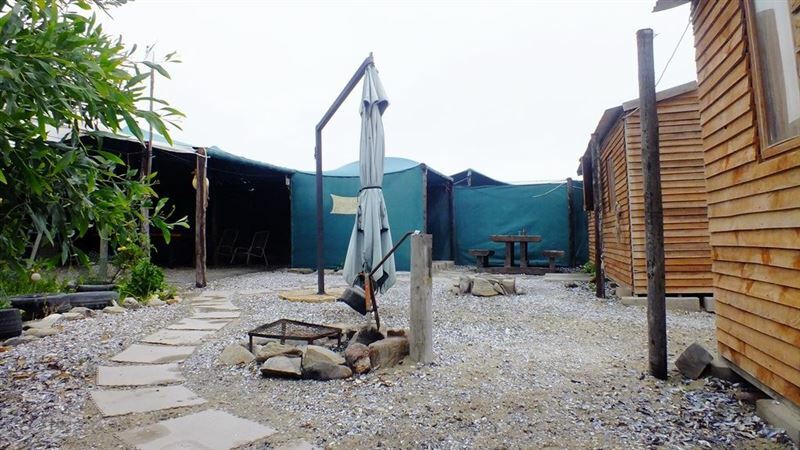 A large shaded camp fire braai area with a huge 12 man table is available in the shared relaxation area. 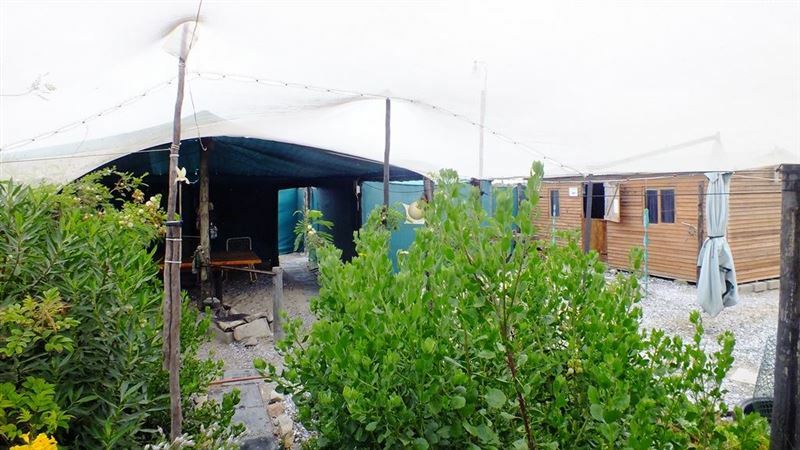 The total capacity of the camp is 12 people, which includes children.Each area is fenced by 2 m high 95% shade netting to ensure total privacy and wind protection for the group. The entire camp is surrounded by a 2m wire fence and an open buffer area, and our beloved Great Dane is the chief security officer, ensuring safe off-street parking for your vehicle, and keeping the kids out of harms way.To the North and North East of us lies the vast expanse of the saltpan area. On the South and West of us, the industrial area is visible, and to the far East (1 km), lies the Sizamile township. 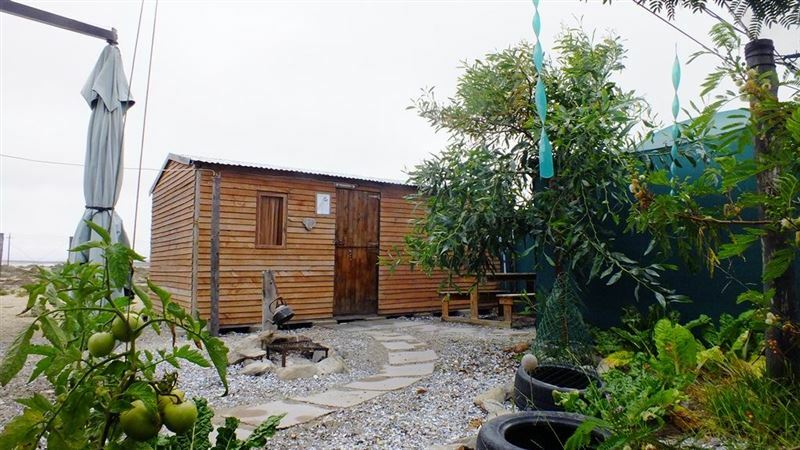 Once inside the camp, the outside world disappears and you live in a little world of your own.Soutpan Safari Camp is about 500 m from the Port Nolloth town centre as the crow flies, and about 700 m from the sea.PLEASE NOTE THAT WE DO NOT SUPPLY BEDDING - YOU SHOULD BRING YOUR OWN. "This site is a dump"
"The description is perfectly clear, so those who have complained obviously didn&apos;t read it. It&apos;s a great place to stay for a night, especially if travelling on your own. On balance I would stay there again." "Cheap but a bit strange set-up. Covered completely by netting as sun protection means you are feeling quite closed in and if you braai the smoke will just hang there. Ok for one night as a low budget stay but not recommended for long stays." "I was at first confused by this place but in no time flat it became obvious this is the place for me. My friend an I stayed over for one night on our way to Laangebaan and then decided to come back for 2 more days. This is what immersive eco tourism is supposed to be. 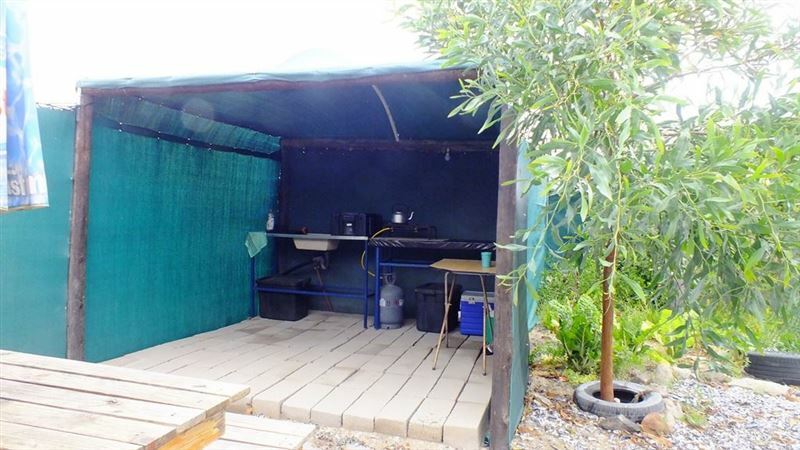 loved the outdoor shower and the salt pan next to the safari camp. Its how one should experience the richtersveld and surrounding areas. if you want dstv go elsewhere. Christo and his wife have created a haven that from what i can see in the new pics is even better than when i was last there. i look forward to taking the family in the near future." "Had a relaxing time this weekend. Love the outdoor feel. The hosts are amazing. If you love campingthis is the place to go." "We had a great stay and felt very at home!" "We didn&apos;t stay!The location is very questionable. We found the place next to the local industrial area with a view of the township. We drove past and went into town to find alternate accommodation. 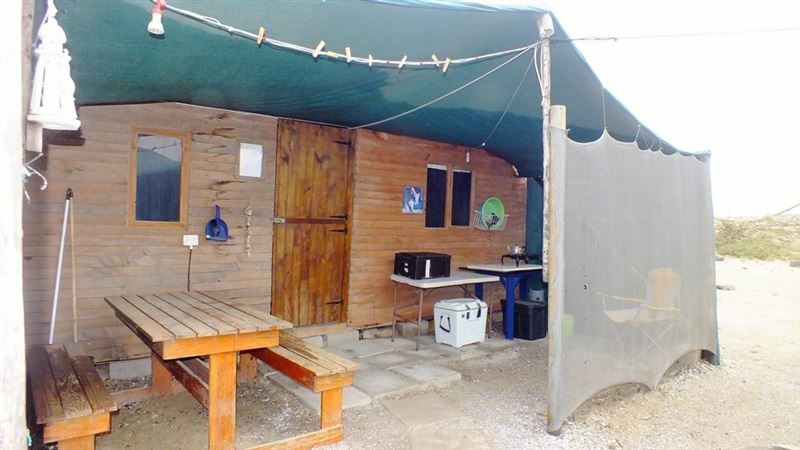 It may have been perfectly fine but a very strange place to stay.Establishment&apos;s ResponseThe general environment reflects the harsh semi desert character of the Richtersveld, where our little place constitutes an oasis. The large dunes of Port Nolloth is visible from the interior. The old Nama chapel is visible across the Salt Pan and the remnants of a 2nd World War radio station can be seen from Soutpan Safari Camp.The Sizamele neighbourhood is visible on the far Eastern side (1 km), while the industrial area lies to the South and West of us.For those of you familiar with Audi Camp in Maun ... that is what we are trying to achieve at this little spot close to Port Nolloth. With a little piece of the character of Joe&apos;s Beerhouse in Windhoek added to the mix ...Hoping that this will prevent future issues and incorrect expectations in this regard"